I got an email from my brother last night, who lives in San Jose, CA. He recently had solar panels installed on his house and I thought I'd share with you some of the information he sent, for those of you out there interested in the cost/benefits of going solar in a sunny climate for electricity. The 39 Kyocera polycrystalline PV (photovoltaic) panels have a total DC rating of about 8.2kW and are hooked up to a 7kW true sine AC inverter, arranged in 3 strings of 13. 2 of the 3 strings are on the side roof and 1 string (of 13) is on the front. Almost none is visible from the street. Basically, I sized it for 80% of my power consumption and about 95% of my electric bill, giving me a little room/incentive to conserve further. So far, it is producing WAY more than what it's supposed to, and I hope it keeps it up. 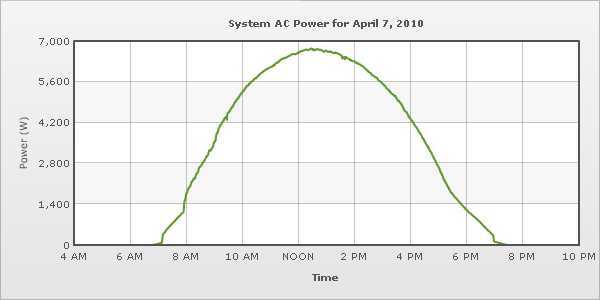 In March, it produced nearly 1200 kWh while, based on historical seasonal models, it should have produced only about 850 kWh. Woot! As the days get longer, it will be producing even more, but right now, it is producing much more than we are using, so it is going into the PG&E utility "bank" for winter. For those in Seattle who don't pay 50 cents per kWh like I do, you can forget about solar panels. On a cash-flow basis, after taxes and payments, this is very "green" for me, saving me ~2/3 of my previous electric costs or about $200 of green per month. It's rather surprising how much energy falls from the sky where only a fraction of our roof is enough for all our electricity. I spoke to my brother about the costs of installation and how long he thought it would take to pay off his solar panel investment. 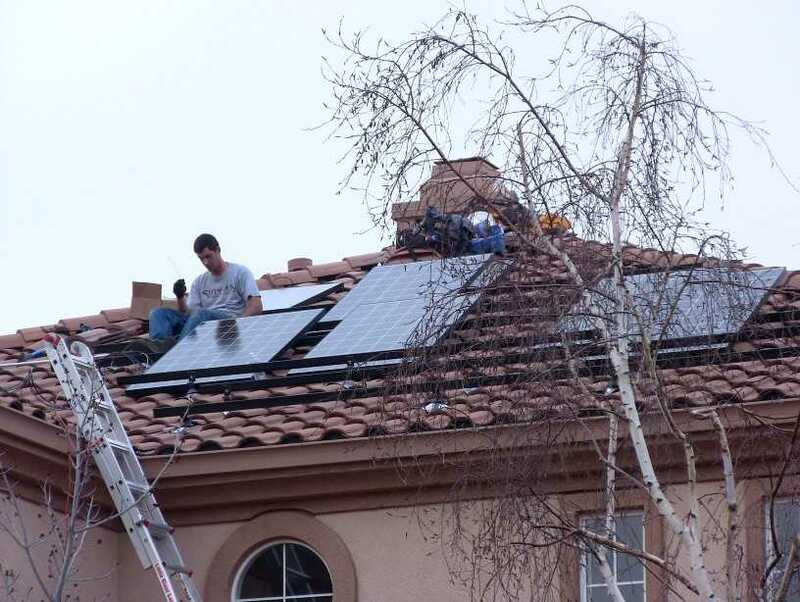 The top line cost for the panels was $48,000, but after $1.10 per watt credit from the state of CA and other federal credits and state rebates, he ended up paying only $28,000. He financed that through a home equity loan that he pays $85 a month on. Since he saves about $300 per month on electricity, it ends up being more like $215 savings a month. At this rate it will take him less than 8 years to pay off the solar panels. And, after that point, it's free electricity. It's also possible that he could make money in the future since CA is in the process of figuring out how to compensate people generating electricity into the grid. Not only is he saving money in the long-term, but he is substantially lowering his carbon footprint. According to the solar panel computer (which, by admission, is probably not extremely accurate), he saved 22,300 pounds of CO2 in March. That's the equivalent of burning 1,150 gallons of gasoline in an average car. For one month. So, if you are thinking about going solar and you live in an area with high electricity rates and a lot of sun (and generous rebates), then get some solar panels already! Crunchy - I thought about going solar, and the guy even came out. Even if we covered our roof in panels in the peak of summer we still wouldn't produce our entire output, we have a lot of cloudy days. We also don't qualify for any of the "rebates" the rebates are in fact credits for your income tax to offset liabilities, liabilities we don't have. So our system to produce 40% of our electricity in peak (6 weeks a year) would cost us $28,000 and save us little. Another example of a government program ignoring those who could use the help the most and benefiting those who could afford the program on their own. When I can afford the solar panels (without a loan) I will be adding them (and hopefully the cost will have fallen and the tech improved), because its going to be about 10 years. I know that solar can be a great idea, depending on where you live and what the rebates are, but I can't overemphasize the need for people to INSULATE their homes first! Solar cells on the roof look very nice. But if heat is escaping from every door, window, and crack, from under the floor and through the ceiling at every moment, then through winter most of the solar energy gathered is being used to do a job that could have been done with a few MUCH cheaper fixer-uppers - pink batts in the ceiling, draught stoppers, underfloor insulation, thicker curtains and pelmets. It's like buying a Prius. Looks great and very flashy and green, but the real green option is a bicycle. Or, if you really need a car, a very old 3 cyclinder secondhand commuter hatchback vehicle that runs on practically nothing. Don't get me wrong - I'm not against solar. I just think it's another way that people think that buying more will solve our problems, when the real solutions lie in buying and using less. I wanted solar panels but they just won't work for us. It really stinks cause we have a lot of sunny days here in Hawaii. The problem here is you have to find a way to store what you make. It doesn't work the way it does for your brother (and other mainlanders) over here. Solar water heaters are popular though, most of the houses I'm looking at come with them (and no I didn't have to include that in my house search, there are really just that many with them). I wish it were different but I doubt anything will change here. If the electric company was willing to "hold" onto what those with solar panels make it could put them out of business. LOL in this area one should start with solar hot water, cheaper, saves on your electric bill. Then graduate to solar electricity. Or so they (City Light) tell me. I think wind energy would be better here. Or Tide generators. Rob - We recently (within the last 3 years) put in an on demand water heater, simply because I couldn't find any useable info on Solar Water Heaters. Anyone want to point me in the right direction for the NorthEast? I live in the mid-atlantic area. After years of working to reduce our power usage - which we were able to cut in half, we thought it would be a good time. 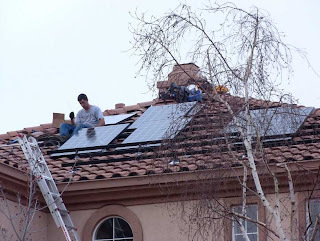 We refinanced our home to cover the cost of a PV system after weighing the pros and cons. We put solar panels on our home in August of '09. For us, this will cover 50% of our electric usage. In theory it should repay itself in 10 years. So far, everything is behaving just as expected. The providers really make everything easy. At this point I would definitely make the same decision again. I'll be tracking the performance closely and continue working to reduce my usage. I live near SJ and have been trying to figure out what solar company to go with. There have been some fraudulent installers exposed. Who did your brother go with? Fifty center per kwh? Yikes! Our total monthly electric bill is about $55 (~375 kwh), and that includes the wind power upcharge. We live in Northern Vermont-and installed a 4kwh PV system 2 yrs ago. 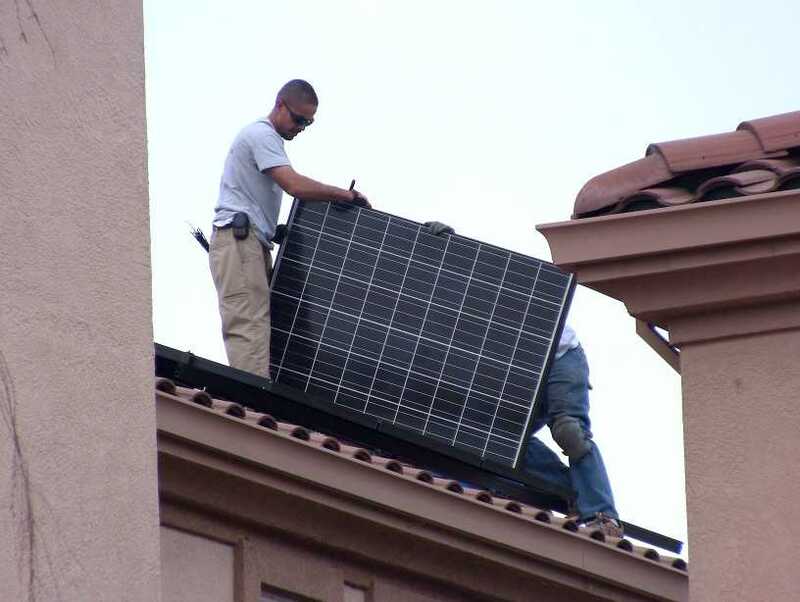 We're part of a net-metering program which means we get a credit from our power company for any extra power we generate. Our average daily usage is 13kwh/day. Usually our panels are covered in snow for Dec/Jan/Feb..but this year we actually generated an average of 7kwh/day of power in February! In March we had an average of 13kwr/day-so we were essentially covering our daily power needs. Now that we're into April-we're routinely generating more than 20kwh/day-so we're moving into credit territory! So many of our friends say "why bother with solar-you only can generate power a few months/year"...and we say-every little bit helps. We also have solar hot-water preheat. On sunny days this winter when the temp was below zero...we were pre-heating our water. Sure it doesn't pay for itself 100% in the winter-but every little bit helps! Another method you can use if you have the capital/access to capital is a heat pump/geothermal. You take the heat out of the ground to heat your house in winter. Otherwise you can take the heat out of the outside air. The ground method of extraction is better but the investment to run the pipes through the earth costs a lot.